UK-based Wrightstyle supplies specialist steel and aluminium glazing systems worldwide. Jane Embury, the company’s marketing director, looks at evacuation planning for today’s high-rise buildings. Legend has it that prisoners would sigh as they crossed it, on their short journey to a life behind bars. Nowadays, the Ponte dei Sospiri, or the Bridge of Sighs, is one of Venice’s star tourist attractions. Built in 1600, it joins what was the Prigioni Nuove, or new prison, to interrogation rooms in the Doge’s Palace across the canal. The view from the bridge was the last glimpse of the outside world that prisoners would see, prompting Lord Byron to poetically name the bridge. But the Bridge of Sighs, built for the mundane purpose of transporting people from one building to another, also has one further claim to fame. It is the world’s first skybridge. Once a common architectural feature joining skyscrapers in New York, they not only joined tall buildings, often owned by the same company, but provided a horizontal means of escape in the event of fire. Nowadays, we think solely about escape in vertical terms, usually downwards to street level. But the skybridge concept has not been totally forgotten and Manhattan still boasts a number of the historic structures. The best current example is between the Petronas Towers in Kuala Lumpur, Malaysia. They were the tallest buildings in the world between 1998 and 2004, and remain the tallest twin towers internationally. A double-deck skybridge connects the two towers on the 41st and 42nd floors. The skybridge isn’t actually joined to either tower, being designed to slide in and out of them as the towers sway several feet in strong winds. "Designers and fire engineers are having to look again at features such as skybridges in evacuation planning." For the Petronas Towers, the skybridge provides an innovative fire safety feature, while also being an iconic feature of the conjoined buildings. But as we build higher into the sky, with super-tall buildings set to dwarf anything constructed today, designers and fire engineers are having to look again at features such as skybridges in evacuation planning. More than anything, they are having to revisit the computational models used to predict how a building can be safely evacuated in the event of a fire. Those models test design configurations to determine whether a building’s safety characteristics are adequate, from the number of evacuation routes to the width of exit doors. The trouble, of course, is that evacuation involves the movement of people and the behaviour of flesh-and-blood humans can’t so easily be predicted. Residential buildings, including hotels, pose a different dynamic. People can be asleep, not dressed, and have only limited knowledge of escape routes. That can seriously extend evacuation times and, worse, lead to re-entry behaviour, for example, to retrieve valuables. Nor is physical impediment simply about age or infirmity. As buildings are increasing in height, our physical abilities are diminishing. The buildings in which we live and work are getting taller, while we are getting fatter and more unfit. That has ramifications for evacuation procedures and the length of time to exit a building, which is something that designers and fire engineers will be researching further. Indeed, computer modelling can only take us so far in designing in safety. What is also needed is an understanding of human behaviour in an emergency situation, particularly the factors that have been shown to influence our decision-making processes. By understanding those factors and processes, a fire safety team can develop a more comprehensive and predictive behaviour model for a building’s fire evacuation. Those predictions have to cover ‘exit-choice behaviour’, which involves the different exits that people will choose to leave by, often because they’re also the entrances and routes by which they arrive at work. In other words, not maybe the closest exit. Nor does it model ‘pre-movement times’, which is the period immediately following a fire alarm, when the fire has been detected but doesn’t yet pose a threat. Simply, people don’t always regard an alarm as an immediate call to action. Many will assume it is a false alarm or a fire drill, and do nothing. It adds up to a building evacuation that may be greatly delayed, or patchy in nature. Recent research indicates that this ‘pre-movement time’ is a more significant evacuation factor than the length of time taken to reach an exit. As much as two-thirds of the time it takes people to exit a building after an alarm is start-up time, time wasted in looking for more information. All of those factors and many other variables can influence estimates of evacuation times, and therefore the level of protection within a building to safely allow the occupant population to escape. Those calculations have never been more important, with a whole raft of super-tall buildings being built, mostly in the Middle East and Asia. The tallest of them all, on which work has begun, is the £780m Kingdom Tower in Jeddah, Saudi Arabia, which will stand at just more than 1,000m and have 200 storeys. It will be three times higher than London’s Shard, Europe’s tallest building, and 173m taller than Dubai’s Burj Khalifa, currently the world’s tallest building with 160 storeys. Modern glazing systems are now an integral part of fire protection strategy, providing up to 120min of protection against radiant heat or toxic gases, giving everyone, however infirm or slow, more than enough time to exit a building. Building in time is what glazing systems can do and time-to-exit saves lives. High-tech fire suppression systems, refuge floors, protected elevators and well-designed staircases all have a part to play in modern evacuation planning. But the role that advanced glazing systems have is also a vital element, and we are pleased that our systems can now be found in buildings great and small across the world. 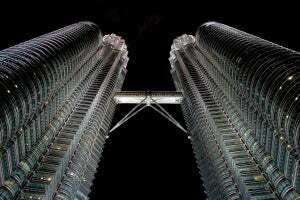 Photo: Petronas Towers in Malaysia. Image: courtesy of Christophe Eyquem at freeimages.fr.